Founded in 1902, OGE Energy (OGE) is a regulated electric utility that generates and distributes power in Oklahoma (91% of electric revenue) and western Arkansas. Its coal-fired and natural gas-fired power plants, wind farms, and solar panels serve 842,000 customers in 267 mostly rural and suburban communities. The company has a total of seven power plants and four renewable energy sites with a capacity of 6.3 GW, 346 substations (for distribution), and over 52,000 miles of overhead and underground transmission lines across its areas of operation. Electric Utility (Oklahoma Gas & Electric): 75% of projected 2018 earnings. Natural Gas Midstream Operations (25% of projected 2018 earnings): owns a 25.7% equity stake and 50% general partnership stake in Enable Midstream Partners (ENBL), a midstream MLP. Enable Midstream is a joint venture between Centerpoint Energy and OGE that owns: 12,900 miles of gas gathering pipelines, 14 gas processing plants, 13,300 miles of gas & oil transportation pipelines, and 86 billion cubic feet of gas storage capacity. Like most electric utilities, OGE has been transitioning from a large dependence on coal to cleaner sources like natural gas and renewable energy. Natural gas, wind, and solar now account for over 75% of the company's power sources, up from 56% in 2007. Regulated utilities are the epitome of a durable business because they are essentially government-sanctioned monopolies with entrenched customer bases and no competition within their given service areas. To ensure reliable and affordable service for customers, regulated utilities are overseen by state regulators who determine how much of a return on equity a utility is allowed to earn in order to invest in maintenance, expansion, and improvements of its infrastructure. In the case of Oklahoma Gas & Electric, the regulators that determine these rates are the Arkansas Public Service Commission (APSC) and Oklahoma Corporation Commission (OCC). Both regulatory bodies have set OGE's allowed return on equity at 9.5%, which is about in line with the national average for electric utilities. 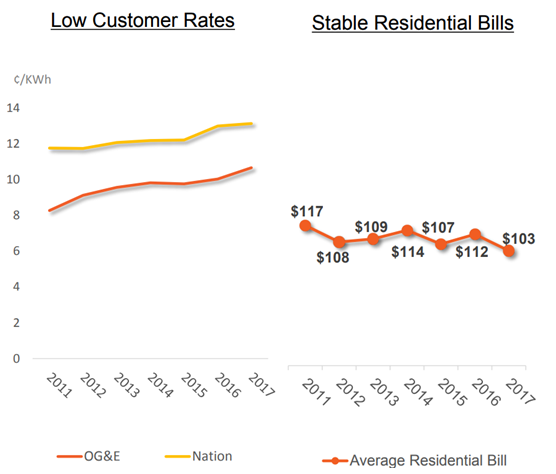 You can see that OGE's customer rates are well below the national average charged by utility companies, and residential bills in the company's service territories have actually declined over the last six years. Therefore, OGE seems like it should be reasonably positioned to have more breathing room with regulators in future rate cases. Besides requesting rate increases and benefiting from population growth (OGE's customer count has increased 1.1% annually over the last five years), the main way an electric utility grows its earnings per share is through increases in its base rate. Base rate is the value of assets upon which a utility is able to earn its permitted return on equity, and is ultimately what determines how much it can charge customers. In recent years, OGE has been aggressively investing ($4.6 billion since 2011) in infrastructure expansion, grid modernization, and environmental compliance. This has led to mid-single-digit growth in its base rate, and thus its earnings per share as well. As a result, OGE has been able to deliver strong dividend growth in excess of 8% per year. That's especially fast compared to other regulated utilities which normally grow dividends just 2% to 5% per year. OGE expects to be able to increase its dividend growth rate to 10% in 2018 and 2019. That's thanks to regulatory earnings growth of 4% to 6% a year, along with a low payout ratio of 65% in 2017. To help achieve this strong regulated EPS growth, the utility plans to invest an additional $3 billion over the next five years. Over the long term (beyond 2019), OGE's annual dividend growth will likely return to more of a mid-single-digit pace. However, that's still among the fastest payout growth rates in the utility industry. Supporting this fast growth is OGE's ownership stake in Enable Midstream Partners, the midstream MLP it co-founded in 2013. OGE established this partnership to monetize its midstream assets, meaning the gas gathering, processing, storage, and transportation networks it owned in some of Oklahoma's shale formations to benefit from the U.S. boom in gas production. This network is also connected to low cost and growing gas production sites in Arkansas, Louisiana, and Texas. As a co-sponsor of Enable Midstream, OGE manages and sells its assets to the MLP, which raises external debt and equity capital from investors. The cash flow produced from these assets are then used to fund the MLP's distribution, a tax-deferred form of dividend. OGE owns about 25% of Enable's limited partnership units (the equivalent of shares for MLPs), as well as 50% of its incentive distribution rights, or IDRs. ￼￼￼IDRs are designed to incentivize sponsors to grow the MLP's payout quickly. That's because above certain quarterly targets, more of the increased payout goes to the sponsor in the form of IDR fees. Enable Midstream's quarterly distribution is currently 31.8 cents per share. Based on the schedule above, this means that OGE is receiving no IDR fees, but just regular payouts on its common equity stake. However, these payments are still expected to generate about 25% of the utility's earnings in 2018. If Enable Midstream is able to grow its payout to higher levels in the future, than OGE stands to capture up to 50% of all marginal distribution growth. 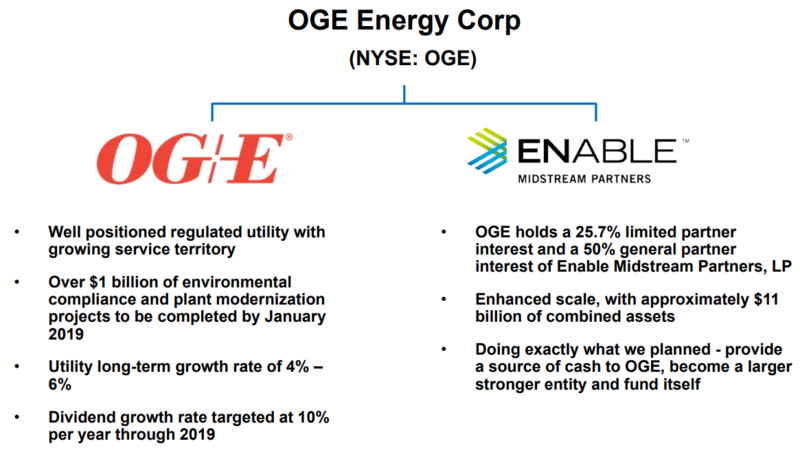 And since Enable is now acquiring non-OGE assets (including an oil pipeline in North Dakota's Bakken formation), this potentially gives the utility a meaningful growth catalyst that could drive above industry average growth for the foreseeable future. Overall, OGE appears to represent a potentially attractive income growth investment. The company enjoys stability from its core regulated utilities business, but it also has a potential growth kicker in the form of Enable Midstream Partners. That being said, investors interested in OGE need to understand that it still faces its fair share of risks and growth challenges in the years ahead. As a regulated energy utility, OGE arguably has less fundamental risk than the average dividend-paying stock, but the company still faces several growth challenges going forward. For one thing, the population of Oklahoma isn't increasing very fast. For example, the U.S. Census Bureau expects the state's long-term growth rate (through 2075) to be about 0.6% a year. Other regions of the country, such as Florida and the Southeast, are projected to enjoy stronger growth upwards of 2% over the long term. Another thing to consider is that the regulatory environment in Oklahoma and Arkansas, while not terrible, isn't necessarily very favorable either. For example, in 2011 and 2015, the utility filed with regulators requesting base rate increases to cover the cost of investments into infrastructure expansion, grid modernization, and environmental compliance. The company had requested 10.25% returns on equity but was only approved for 9.5% in Arkansas and 9.9% in Oklahoma by regulators. In Oklahoma that figure was later reduced to 9.5%. Going forward management believes that Oklahoma regulations may become more favorable. That's because the state legislature is creating a special commission to look into potentially overhauling the Oklahoma Corporation Commission. However, there is no guarantee that this will create a more friendly regulatory environment or a higher allowed return on equity in the future. Finally, it should be noted that the primary growth catalyst for OGE, Enable Midstream Partners, also faces a lot of uncertainty. For one thing, the Federal Regulatory Energy Commission (FERC) just announced that an important tax deduction provision going back to 2005 would no longer be allowed. This could potentially affect many midstream MLPs, specifically resulting in decreased cash flow on some of their pipeline networks. However, the ruling only applies to FERC-regulated interstate pipelines. While close to 80% of Enable's pipelines are interstate, the MLP has announced that it doesn't believe that it will be significantly impacted by this ruling. That's largely because 77% and 62% of Enable's revenue and gross margin, respectively, was generated from its gathering and processing businesses in 2017. Furthermore, much of its interstate pipeline contracts are under negotiated rates, as opposed to cost-of-service rates that are going to be affected by the rule change. With that said, the MLP is still monitoring the situation closely to see what parts of its business might face potentially lower rates in the future. A bigger problem for Enable Midstream is that MLPs have been hit hard in recent years by the oil crash, concerns over higher interest rates, and now by increased regulatory uncertainty. The issue for OGE and Enable is that the MLP business model is heavily reliant on raising low-cost external capital from debt and equity markets. That's because MLPs pay out most of their cash flow as distributions, retaining very little cash to fund future growth internally. In addition, while most of Enable's contracts are fixed fee in nature, the MLP has a relatively greater volume and commodity price sensitivity compared to its peers because it largely focuses on gas gathering and processing activities. Should natural gas prices fall and produces pull back on production, Enable's cash flow could decline. Enable Midstream is currently retaining 20% of its distributable cash flow, indicating a secure distribution. However, the MLP's small size and relatively high commodity sensitivity means that it only has a BBB- credit rating, one level above a junk bond. With Enable's unit price now very low from the selloff in MLPs, the partnership might have a harder time growing profitably. That could prevent the MLP's distribution from rising high enough to generate large IDR fees for OGE in the years ahead. In fact, analysts currently estimate that it will take Enable Midstream until 2020 before its distribution rises high enough to achieve any IDR fees for its co-sponsor. The partnership is not expected to reach the top IDR tier (50% of marginal distribution growth for OGE) until 2024. However, remember that all long-term projections need to be taken with a large grain of salt. That's because they are all built on the assumption that Enable Midstream will be able to start growing its payout relatively quickly. However, the MLP hasn't raised its distribution since the fourth quarter of 2015. While distributable cash flow per unit is growing at a modest rate, should rising interest rates and a low unit price continue to pressure the MLP, then Enable Midstream may end up being forced to shift to an internally-funded business model. In recent years as the midstream MLP industry has suffered from numerous setbacks, more midstream operators, such as Enterprise Products Partners (EPD) and Kinder Morgan (KMI), have announced plans to pursue such a strategy. Internally-funded MLPs retain enough cash flow to cover the equity portfolio of their growth spending requirements. It basically means that they become independent of fickle equity markets to fund their growth projects since they no longer rely on issuing units to fund their investments. In other words, as long as its unit price remains low, Enable Midstream might not be able to grow its distribution much, but rather be forced to retain more cash flow to continue expanding organically. That in turn means that its payouts might remain too low to generate IDR fees for OGE for the foreseeable future (if ever). In that scenario, OGE would see a meaningful growth catalyst dampened, resulting in earnings and dividend growth coming in slower than expected. Regulated electric utilities are often a favorite holding of low-risk income investors, and for good reason. Their government-sanctioned monopoly status results in a durable business, and they enjoy guaranteed returns on equity that make for steady, if somewhat slow, earnings growth and rising dividends. OGE possesses the traditional benefits of a regulated utility, but with much faster growth in both earnings and dividends. While some of its growth catalysts face uncertainty (most notably Enable Midstream's distribution growth) and Oklahoma regulators haven't been the friendliest to OGE in recent years, the company still appears to provide investors with a secure and growing payout. Even if the company's payout growth rate falls in the coming years, OGE will still likely be able to grow its dividend faster than the industry average. For investors who are comfortable with OGE's concentration in Oklahoma and its moderate exposure to the midstream MLP industry, the stock could be an interesting candidate to consider as part of a well-diversified income portfolio.